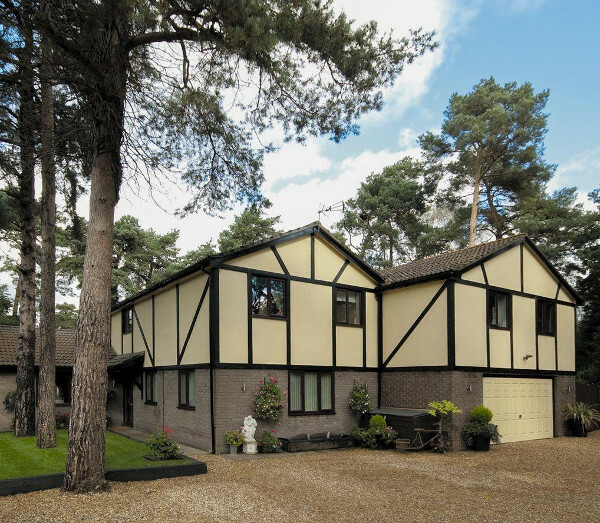 "Treetop House" in Ringwood, on the Hampshire and Dorset border sleeps 12 people in 6 bedrooms. Treetop House is a large holiday cottage, ideal for friends and family to holiday together and explore the area; and to enjoy the garden with the hot tub and swimming pool. Treetop House sleeps 12 people, with the 6 bedrooms being made up of 3 double bedrooms, a twin bedroom, a single bedroom and a bedroom with 3 single beds. There are 5 bathrooms at Treetop House too. The living room has a TV, DVD player and an iPod dock. You have a separate conservatory and dining room. With the kitchen having a double oven, hob, microwave, fridge, freezer and a dish washer. The washing machine can be found in the utility room. The garden has a patio with outdoor furniture and a barbeque. You also have your own outdoor swimming pool for use during the summer months (see the photo below), and a private hot tub. There is parking for 4 cars. Treetop House has central heating, with your gas, electric, bed linen and towels all included in the price of your holiday. You also have that staple of 21st century living, Wi-Fi. Weekly holidays start on a Friday, with short breaks available on a Friday or Monday start. You may want to leave the pool and hot tub behind for the day, and explore the area. You can easily get to Bournemouth, Poole or Milford on Sea for a day by the coast. Or head into the New Forest National Park for walks in the country. Cranborne Chase Area of Outstanding Natural Beauty is a short drive from Treetop House too. Back at your cottage you'll find the nearest pub, shop and restaurant all within ½ mile of Treetop House. Should Treetop House not be to your liking, but you fancy staying in the area around Dorset, you might well be interested in the cottages below. All these cottages are within a few miles of Treetop House.